“United gave me a good feeling. You can feel it immediately when you walk in a club." He immediately caught the eye of current first team coach, Kieran McKenna who was in charge of United’s Under-18’s. Tahith announced himself in his first season at the club by scoring a stunning strike at Old Trafford in the FA Youth Cup. This turned out to be United’s only goal in that competition in the 2016/17 season. Unfortunately for Chong, a cruciate injury cut short his first campaign in Manchester, with the season only in January. After spending 10 months on the sidelines the Dutch teenager's stock continued to rise. A left-footed wide player, Chong started his United career as a proper throwback to a Manchester United winger; he loves to show off his pace and trickery as he gets up and down the flank, creating goals for others as well as scoring them himself. His explosive style of play makes him incredibly hard to deal with, and it is something of a shock to see a player so tall and skinny move so quickly across the ground. Chong has primarily moved out onto the right flank for United’s Under-23s and he has caught the eyes of fans in that position too. While he still hugs the touchline in the manner of a classic winger, Chong also looks to cut inside and put the ball on his stronger left foot. Chong was crowned Jimmy Murphy Youth Team Player of the Year at the 2018 season, beating off stiff competition from Lee O'Connor and fellow first team debutant this season, James Garner. 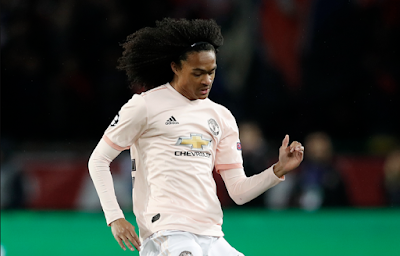 Playing for the Under-23s this season, Chong has so far scored 7 goals in 15 appearances and created a further three, whilst also appearing in United’s UEFA Youth League campaign. Chong was one of a group of United academy players taken on the club’s pre-season tour of the US, and he featured for 94 minutes – the most minutes of any academy played included in Mourinho’s travelling squad. He earned a first call-up to the senior squad in a competitive fixture against Juventus in October 2018, when he was named on the bench. A few months later, Chong was handed his debut by interim manager Solskjaer in the 2-0 FA Cup win over Reading, being introduced as a second-half substitute for Juan Mata. On Wednesday in Paris it was time for Chong to make his UEFA Champions League bow. The young, fearless, Dutch winger showed great courage and confidence whilst on the pitch for the last 10 minutes against PSG, taking players on and committing defenders, something that he specialises in. What impressed me most about his little cameo however, was the way he wasn’t phased by the whole occasion. From the moment he came on for Andreas Pereira he was demanding the ball from his seniors, confident that he could make the difference and win the game for his team. It would also have been noticeable to eagle eyed United fans that Chong was ready to take the corner they thought they had before being awarded a penalty after a VAR review. This further demonstrated Chong’s confidence in his own ability, as this probably would have been United’s last chance to score and go through to the next round had the penalty not been given. The question now will be what is next for the Dutch wonderkid? If as expected, Solskjaer gets the managers job on a full time basis in the summer, then you can envisage Chong getting more opportunities to be involved with the first team in the future, especially towards the end of this current season. Since Solskjaer took over at old Trafford, he has not been afraid to promote youth players in to first team, something that can only bode well for the promising winger. If United are keen for the 19-year-old to gain regular first team experience, they could also look for him to make a temporary move abroad. One potential option could be sending him on loan to Sporting Lisbon in a deal that could see Bruno Fernandes move in the opposite direction with reports in Portugal claiming that United have made first contact with Sporting over a transfer.